Jews around the world this week are reading the story of Noah in Genesis 9. Ironically, while most people associate this story with the saving of animals in the Ark, it is in this particular Torah portion that God first gives humans permission to kill animals for food. A year ago this week, The Beet-Eating Heeb, as a service to readers and animals alike, explained why Genesis 9 doesn’t really condone meat-eating, after all. Click on this image to see a measure of how we treat God’s covenant with animals. But BEH left out an important point, which he will rectify right this very second. If God really approves of us killing animals by the billions, why would He say that animals are explicitly included in His covenant? Every living creature is in covenant with the Divine. God was evidently concerned that humans would want to overlook this inconvenient truth, especially when there is meat on the grill. So God repeated the statement not once, but three additional times. Genesis 9, Verses 15, 16 and 17 all state that God includes animals in his covenant. God does not want us to slash the throats of animals, or to abuse them in countless and hideous other ways, as we do in modern factory farms. Not if the word “covenant” means anything. By definition, God would never have included the animals in His covenant if he didn’t care about their well-being. To which you’re probably saying, “No duh,” or amen. To take it a step further, God could have established a covenant with animals without telling humans about it. But that would defeat the purpose. The reason this covenant is repeated four times in the Torah is because He is depending on us to make it a reality. This is fundamental to Jewish thought. We are supposed to be God’s partners in perfecting creation. We are supposed to implement God’s will. Sadly, we haven’t just ignored the fact that animals are partners to the same covenant we have with God. As the party responsible for making the covenant a meaningful reality, we have trashed it. 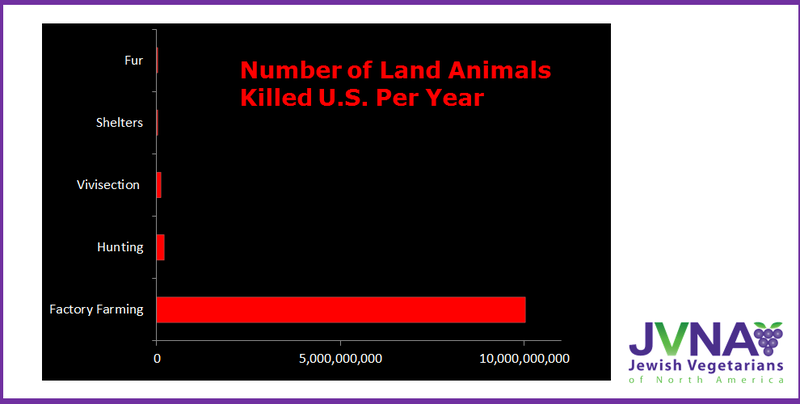 In the United States alone this year, 10 billion farm animals will be killed, while another 200 million animals will be killed by hunters, 100 million more in vivisection, and another 2 million in the fur industry. And these figures don’t measure the brutality, the cruelty, the torture and the torment that these animals experience before they are killed. This is how we honor the Divine covenant. Animals shouldn’t be mad at God for what He said in Genesis 9:3. Technically, He may have given humans permission to eat meat. But He made it perfectly clear that He would strongly prefer that we don’t. The animals should be mad at humans. We have betrayed them. And in so doing, we have betrayed God and His covenant. Fortunately, we can begin to repair this covenant with a simple step. One sure sign that the veg movement is a growing force among Jews is the backlash we’re seeing from certain highly placed but sadly misguided rabbis. This backlash can be traced at least as far back as 2002, when Aish.com, one of the most popular Jewish Websites, posted an essay that attempted to defend meat-eating from a Jewish perspective. Then as recently as two weeks ago, none other than the Vice President of Communications for the Orthodox Union launched a direct yet feeble attack against Jewish vegetarianism. The Orthodox Union (OU) is the world’s largest kosher certification agency, so the fact that it posted an essay condemning vegetarianism on its home page is interesting, although not altogether shocking. BEH views these anti-vegetarian screeds as a positive development. The only reason these rabbis are writing articles in defense of killing animals is because an increasing number of Jews are waking up to the horrors of factory farming. Moreover, what these articles show, by the very weakness of their arguments, is that Jews are standing on very solid ground, theologically speaking, when we advocate for plant-based diets. To illustrate just how weak their arguments are, let’s take a closer look at the Orthodox Union post, written by Rabbi Eliyahu Safran, their VP of Communications. Rabbi Safran starts out with a doozy of a logical fallacy. His anecdote about an elegant-looking woman fussing over her small dog is, first of all, totally irrelevant to the issue at hand. There is no evidence that the woman is a vegetarian. In fact, odds are she is a meat-eater, like Rabbi Safran. Moreover, the story is a perfect example of what’s known in logic as a straw-man argument. Generally speaking, veg*ns who abstain from meat for ethical reasons also care deeply about their fellow human beings. It’s not like God gave us a limited, finite capacity for compassion. It’s not a zero-sum game. Caring about animals does not preclude caring about people. In fact, both God and our Sages recognized that someone who is compassionate toward animals is more likely to be compassionate toward people, not less. The two greatest leaders in Jewish history – Moses and King David – were selected for leadership at least partly on the basis of the compassion they demonstrated as shepherds. Like those two shepherds, veg*ns have expanded their personal circles of compassion to encompass animals as well as people, exactly as the Torah commands us to do. The merciful treatment of animals is a major point of emphasis in the Torah. Or has Rabbi Safran forgotten this? Actually, it’s not the vegans and vegetarians that the rabbi should be concerned about. He should worry about himself and his fellow meat-eaters. Well said, even if it’s obvious. Let’s face reality. Eating meat in our modern era entails either hardening your heart to the suffering of animals or blinding your eyes to it. Rabbi Safran devotes about a third of his essay to a description of the ancient Egyptians’ attitudes toward animals, which is about as irrelevant as the woman-and-dog story. Yet in his entire essay, he doesn’t devote so much as a syllable to the pervasive abuse and heinous mistreatment of animals in factory farming. As a leader of the OU, he is surely aware that kosher slaughterhouses get the vast majority of their animals from factory farms. The Beet-Eating Heeb refuses to either harden his heart or blind his eyes to this reality, to this cruelty. Yet Rabbi Safran, on behalf of the OU, sees fit to attack vegetarianism. That’s chutzpah, folks. Or something worse. Rabbi Safran, out of either surprising ignorance or sheer audacity, tries to justify meat-eating as an “exercise of dominion” over animals. Surely he must know that the granting of “dominion” in Genesis 1:28 is followed immediately by the injunction to eat plants and only plants in Genesis 1:29. The Torah could not be clearer. “Dominion” explicitly excludes the right to kill animals for food. This piece by Rabbi Safran is typical of the anti-vegetarian genre. Time and again, when rabbis seek to defend their consumption of meat, they take Torah quotations out of context, deviate from the principles of logic, and ignore the realities of modern farming. Ah, but there is no point in getting upset at Rabbi Safran or the OU. Rather, we owe them a debt of gratitude for showing the world, if only unintentionally, that vegetarians and vegans embody the highest ideals of the Torah. Now can’t we all just enjoy some seitan brisket?